Unique and deeply accessible, our 500 hour Yoga Teacher Training brings you into the fundamental and central qualities of a yoga teaching practice, through the guidance of 3 experienced teachers. 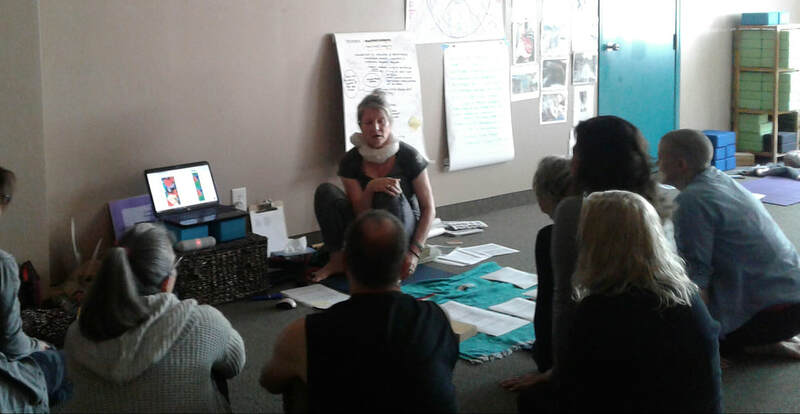 Knowledgeable, friendly, approachable and deeply compassionate Jody, Pat and Trudy will take you deep into the essentials of what it means to be fulfill your potential as a Yoga Teacher. Asana-Biotensegrity-Pranayama-Meditation-Yoga Philosophy-Tensegrity Repair Series-Restorative Yoga- Yoga for Children- Prenatal Yoga-Yoga Therapy are among the modules you will train in. Fabulous Trudy... Thank you! You always present with such grace and love. Great feedback while practice teaching, so we can improve. The "come as you are" atmosphere is very important to me. It is nice to have a teacher who is knowledgeable, humble and passionate about her work. It really comes through with the teaching and makes it easier for us to absorb. Stunning array and variation of content. The overall presentation was friendly, accessible, welcoming. The overall presentation was excellent, easy to follow, well explained. The teacher was super accessible and approachable, and a wealth of knowledge and sharing. Looking forward to more to come. A lot of practice and feeling into the body, sprinkled with the intellectual parts. Overall presentation had lots of angles and aspects to see it from different tools and media. Learned a lot in terms of being a student and being a teacher. Thank you. Learned so much from you and your graciousness.